The art and science of shaping metal parts. Simple to explain, but more intriguing to learn. 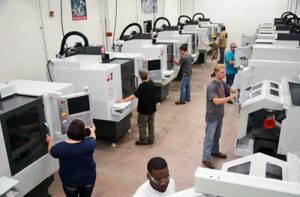 The Precision Machining and Milling Program prepares students with the knowledge and skills in all aspects of precision measuring and shaping metal parts. If you are fascinated with the math involved with object dimensions, plus the hands-on instruction in tooling and machining, this program is for you. You will learn the math and science of metal work, from blueprint to finished piece of precision. Emphasis is placed on bench work and the operation of lathes, power saws, shapers, milling machines, grinders and drills, plus computer-operated equipment for modernizing industries.